A proven Shorthorn sire that is TH Negative. A double Stuff outcross and has the quality and design to impact the breed. Ghost is an extremely impressive bull with tremendous muscle shape, great natural width, extraordinary style, incredible power and stoutness and is extremely sound and free moving. 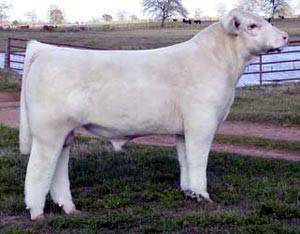 "Ghost" offers new, fresh genetics that can advance any Shorthorn or Club Calf program. His genetic value is enhanced by the sensational quality and consistency of his first progeny that highlighted Rosansky's Fall Festival Sale. Average birth weight of progeny, 79 lbs.